In geometry, a Johnson solid is a strictly convex polyhedron, each face of which is a regular polygon, but which is not uniform, i.e., not a Platonic solid, Archimedean solid, prism or antiprism. There is no requirement that each face must be the same polygon, or that the same polygons join around each vertex. 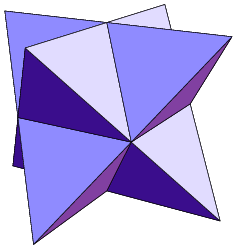 An example of a Johnson solid is the square-based pyramid with equilateral sides (J1); it has 1 square face and 4 triangular faces. As in any strictly convex solid, at least three faces meet at every vertex, and the total of their angles is less than 360 degrees. Since a regular polygon has angles at least 60 degrees, it follows that at most five faces meet at any vertex. The pentagonal pyramid (J2) is an example that actually has a degree-5 vertex. 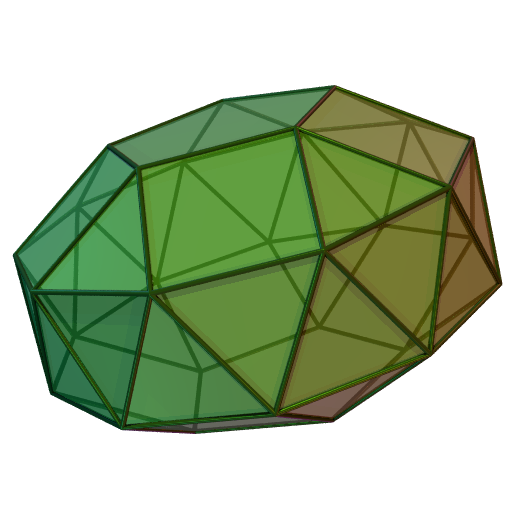 Although there is no obvious restriction that any given regular polygon cannot be a face of a Johnson solid, it turns out that the faces of Johnson solids always have 3, 4, 5, 6, 8, or 10 sides. In 1966, Norman Johnson published a list which included all 92 solids, and gave them their names and numbers. He did not prove that there were only 92, but he did conjecture that there were no others. Victor Zalgaller in 1969 proved that Johnson's list was complete. Of the Johnson solids, the elongated square gyrobicupola (J37) is unique in being locally vertex-uniform: there are 4 faces at each vertex, and their arrangement is always the same: 3 squares and 1 triangle. However, it is not vertex-transitive, as it has different isometry at different vertices, making it a Johnson solid rather than an Archimedean solid. The names are listed below and are more descriptive than they sound. Most of the Johnson solids can be constructed from the first few (pyramids, cupolae, and rotundae), together with the Platonic and Archimedean solids, prisms, and antiprisms. Bi- means that two copies of the solid in question are joined base-to-base. For cupolae and rotundae, they can be joined so that like faces (ortho-) or unlike faces (gyro-) meet. 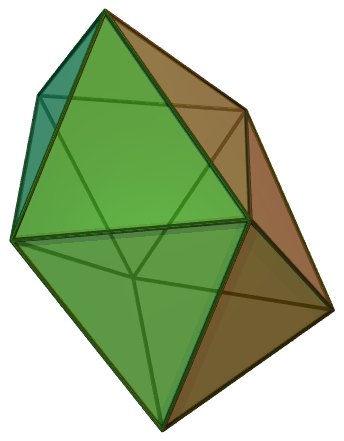 In this nomenclature, an octahedron would be a square bipyramid, a cuboctahedron would be a triangular gyrobicupola, and an icosidodecahedron would be a pentagonal gyrobirotunda. Elongated means that a prism has been joined to the base of the solid in question or between the bases of the solids in question. A rhombicuboctahedron would be an elongated square orthobicupola. Gyroelongated means that an antiprism has been joined to the base of the solid in question or between the bases of the solids in question. 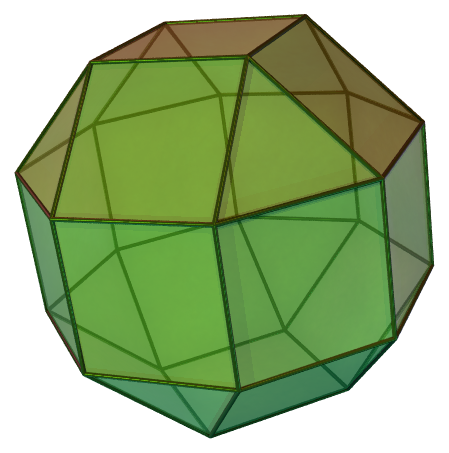 An icosahedron would be a gyroelongated pentagonal bipyramid. Augmented means that a pyramid or cupola has been joined to a face of the solid in question. Diminished means that a pyramid or cupola has been removed from the solid in question. Gyrate means that a cupola on the solid in question has been rotated so that different edges match up, as in the difference between ortho- and gyrobicupolae. Norman W. Johnson, "Convex Solids with Regular Faces", Canadian Journal of Mathematics, 18, 1966, pages 169–200. Contains the original enumeration of the 92 solids and the conjecture that there are no others. Victor A. Zalgaller (1969). Convex Polyhedra with Regular Faces. Consultants Bureau. No ISBN. The first proof that there are only 92 Johnson solids. Sylvain Gagnon, "Convex polyhedra with regular faces", Structural Topology, No. 6, 1982, 83-95. Weisstein, Eric W., "Johnson Solid" from MathWorld.